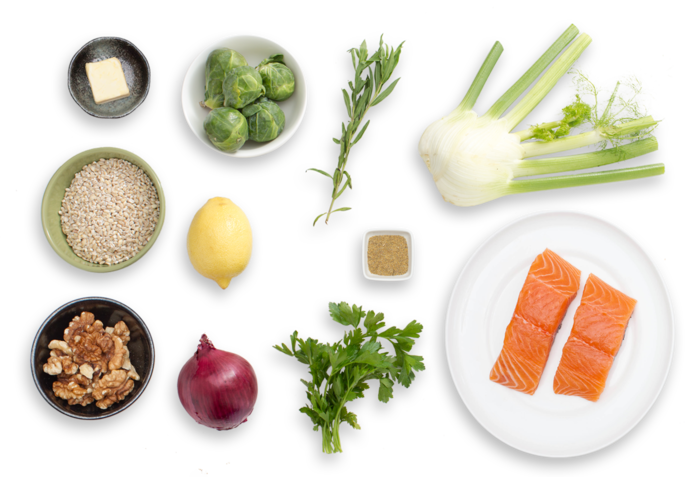 Crispy Salmon & Barley-Fennel "Risotto"
There’s nothing quite as warming as risotto. Though it’s traditionally made with rice (slow-cooked to create a thick porridge), here we tried something a little different. Instead, we’re using barley to give this dish a unique heartiness. 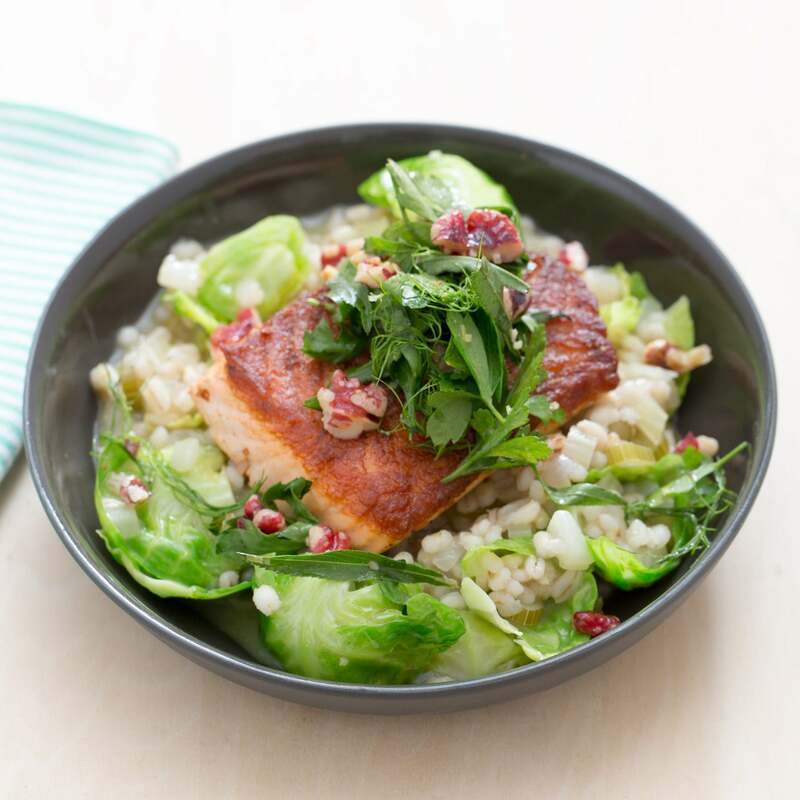 Served with flaky salmon topped with an aromatic, crunchy herb and walnut salad, this dish is fine dining brought right into your kitchen! Wash and dry the fresh produce. Remove the salmon from the refrigerator to bring to room temperature. Cut off and discard the root ends of the Brussels sprouts; separate the leaves. Pick off the fennel fronds (the green, thread-like tops of the plant); place the fronds in a small bowl. 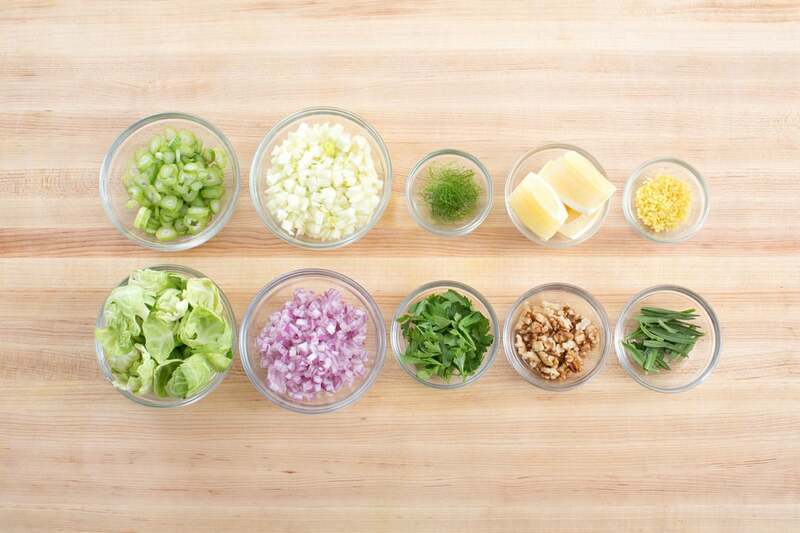 Thinly slice the fennel stems; small dice the bulb. Using a peeler, remove the yellow rind of the lemon, avoiding the white pith; mince the rind to get 2 teaspoons of zest. Quarter the lemon and remove the seeds. Peel and small dice the onion. Pick the parsley and tarragon leaves off the stems; discard the stems. Roughly chop the walnuts. In a medium pot, heat 2 teaspoons of olive oil on medium-high until hot. 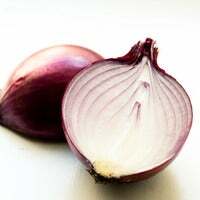 Add the fennel stems and bulb and red onion; season with salt and pepper. Cook, stirring occasionally, 3 to 4 minutes, or until softened and fragrant. 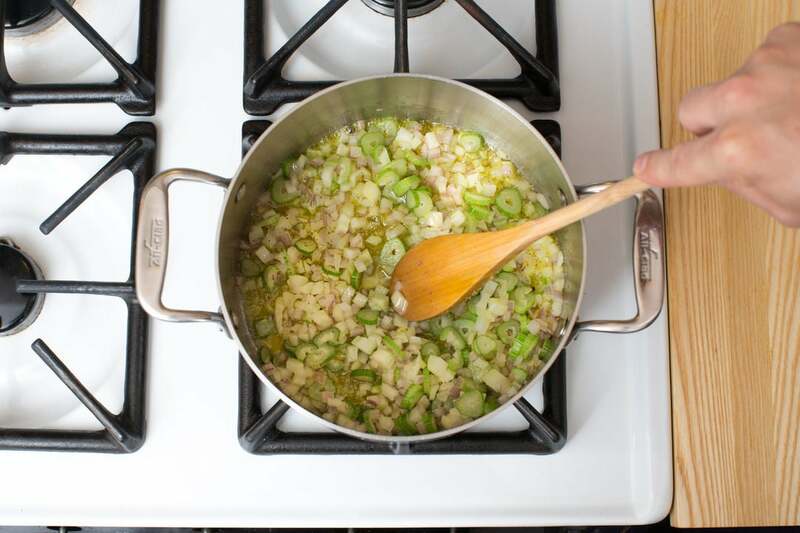 Add the barley to the pot of fennel and onion. Cook, stirring frequently, 30 seconds to 1 minute, or until toasted. Add the lemon zest and 4 cups of water; season with salt and pepper. Increase the heat to high and bring the mixture to a boil. Once boiling, reduce the heat to medium-low and simmer, stirring occasionally, 18 to 20 minutes, or until the barley is tender. Remove from heat. While the risotto cooks, heat a dry, medium pan (nonstick, if you have one) on medium until hot. Add the walnuts and toast, stirring frequently, 2 to 4 minutes, or until lightly browned and fragrant. Transfer to a medium bowl and let cool slightly. Once cooled, add the parsley, tarragon, fennel fronds and the juice of 1 lemon wedge. 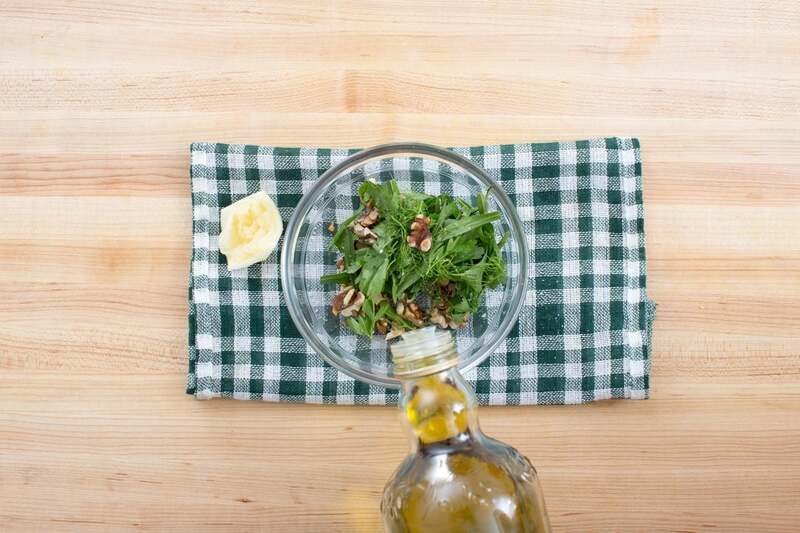 Drizzle with olive oil and toss gently to coat; season with salt and pepper to taste. Set aside. Wipe out the pan. 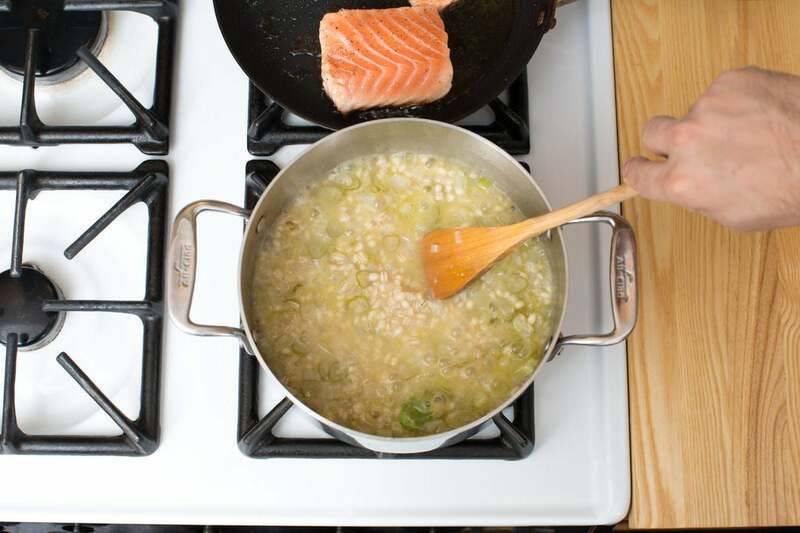 While the risotto continues to cook, season the salmon with salt and pepper on both sides. In a medium pan (nonstick, if you have one), heat 2 teaspoons of olive oil on medium until hot. 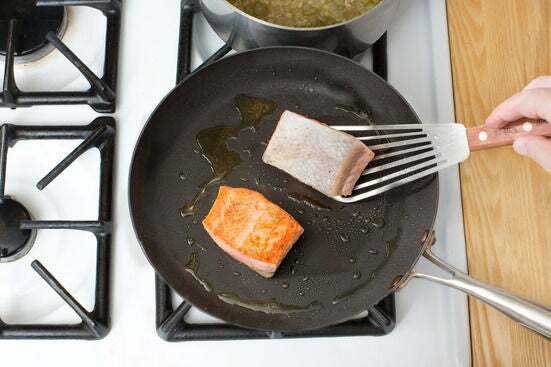 Add the seasoned salmon, skin side up first; cook, loosely covering the pan with aluminum foil, 3 to 4 minutes per side, or until the salmon has reached your desired degree of doneness. Transfer to a plate. 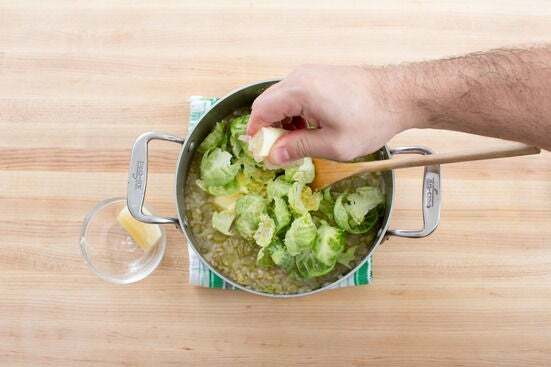 Add the Brussels sprouts, butter and the juice of the remaining lemon wedges to the risotto. Drizzle with olive oil and stir until well combined; season with salt and pepper to taste. To plate your dish, divide the risotto and salmon between 2 dishes. Top with the walnut-herb salad. 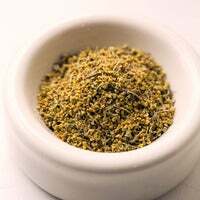 Garnish with the fennel pollen. Enjoy!